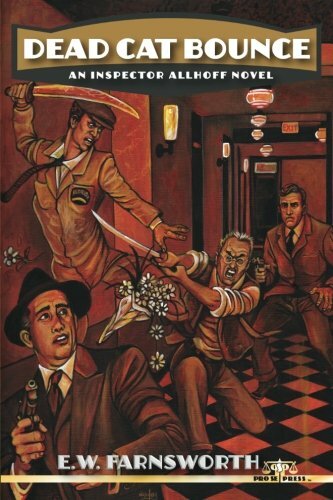 THE MOST UNIQUE DETECTIVE OF CLASSIC PULP RETURNS! NEW INSPECTOR ALLHOFF NOVEL-DEAD CAT BOUNCE- DEBUTS! A Consulting Detective with the Brilliance of Holmes…and An Insanity All His Own that made his debut in the Classic Pulps is back in a full length novel from Pro Se Productions! D. L. Champion’s twisted, yet genius investigator, Inspector Allhoff makes a dark, exciting return by arrangement with Steeger Properties, LLC., in DEAD CAT BOUNCE, an all new novel by E. W. Farnsworth. Originally appearing in Dime Detective Magazine in the 1930s and 40s, Allhoff was a detective like no other. Mangled and left without legs after leading a failed police raid, Allhoff found himself an unofficial consultant to the New York Police Department. Kept in a rundown tenement across from headquarters, Allhoff is assisted by two men, both of which he tortures with his aggressive nature and abrasive words. One, the rookie responsible for bungling the raid which left the great detective an invalid and the other, a career cop going through hell just to get to his retirement. Three men who stew in a cesspool of hate, self doubt, and anger, and yet, led by Allhoff, they solve the strangest cases the NYPD has ever faced! In DEAD CAT BOUNCE, wealthy collectors of weapons are dying in locked rooms and the NYPD cannot stop the rash of murders. That means that Inspector Allhoff and his assistants are on the case. But can they stop the phantomlike killer before more noted citizens die or is this the case that will put an end to their careers? And will Allhoff’s men rise to meet the challenge of the mystery while being beaten by his acerbic attitude and caustic attacks or will they simply leave the broken man to twist in the proverbial wind? Featuring an atmospheric cover by Larry Nadolsky and cover design and print formatting by Sean E. Ali, DEAD CAT BOUNCE is available now at Amazon at https://www.amazon.com/Dead-Cat-Bounce-Inspector-Allhoff/dp/1540443205/ref=sr_1_3?ie=UTF8&qid=1481320007&sr=8-3&keywords=dead+cat+bounce and at Pro Se’s own store at www.prose-press.com for $15.00. The first full length novel featuring Allhoff is also available for only $2.99 designed and formatted by Marzia Marina as an ebook for the Kindle at https://www.amazon.com/Dead-Cat-Bounce-E-Farnsworth-ebook/dp/B01MZZRQOP/ref=sr_1_2?ie=UTF8&qid=1481320007&sr=8-2&keywords=dead+cat+bounce and in most digital formats at https://www.smashwords.com/books/view/686393.